The Low Budget Model - On Special Sale Now! 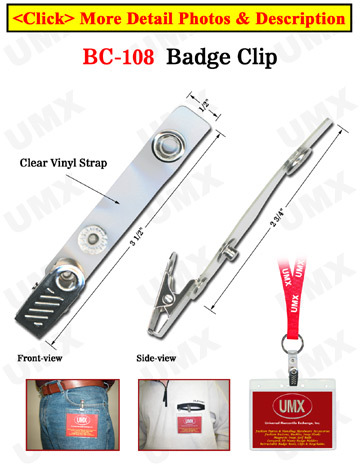 The BC-108 is one of our low cost name badge holder clips that comes with a plastic badge strap. The snap button on the badge strap can be easily opened and closed. Just snap and go! It comes in handy for general use purposes, schools, businesses, trade shows, military, concerts, promotions, meetings, or sporting events. This is offered to all at our low cost for those with a low budget!